European Space Agency's Huygens Probe - Solar System Planets And Moons Section. Huygens probe is On Its Way. The European Space Agency's Huygens probe successfully detached from Cassini on December 25, and began its brief journey to Titan. The probe is currently dormant, though, and will remain this way for most of its 20-day journey to Saturn's largest moon. Four days before arrival, a triply-redundant alarm clock will wake the probe up, and it will prepare for arrival. On January 14, 2005, the probe will enter Titan's atmosphere, descending to the surface in about 2 hours. The European Space Agency’s Huygens probe was successfully released by NASA’s Cassini orbiter early this morning and is now on a controlled collision course toward Saturn’s largest and most mysterious moon, Titan, where on 14 January it will make a descent through one of the most intriguing atmospheres in the solar system to an unknown surface. "Today’s release is another successful milestone in the Cassini/Huygens odyssey", said Dr David Southwood, ESA’s Director of Science Programmes. "This was an amicable separation after seven years of living together. Our thanks to our partners at NASA for the lift. Each spacecraft will now continue on its own but we expect they’ll keep in touch to complete this amazing mission. Now all our hopes and expectations are focused on getting the first in-situ data from a new world we’ve been dreaming of exploring for decades". On 17 December, while on its third orbit around the ringed planet, the Cassini orbiter performed a manoeuvre to enter a controlled collision trajectory towards Titan. As planned, a fine tuning of the trajectory took place on 22 December to place Huygens on its nominal entry trajectrory. While Huygens will remain on this trajectory till it plunges into Titan’s atmosphere on 14 January, the orbiter will perform a deflection manoeuvre on 28 December to avoid crashing onto the moon. Today’s separation was achieved by the firing of pyrotechnic devices. Under the action of push-off springs, ramps and rollers, the probe was released at a relative velocity of about 0.3 m/s with a spin rate of 7 rpm. Telemetry data confirming the separation were collected by NASA’s Deep Space Network stations in Madrid, Spain and Goldstone, California, when the telemetry playback signal from Cassini eventually reached the Earth. The Huygens probe is now dormant and will remain so for its 20-day coast phase to Titan. Four days before its release, a triply-redundant timer was programmed in order to wake-up the probe’s systems shortly before arrival on Titan. Huygens is scheduled to enter Titan’s atmosphere at about 09:06 UTC (10:06 CET) on 14 January, entering at a relatively steep angle of 65º and a velocity of about 6 km/s. The target is over the southern hemisphere, on the day side. Protected by an ablative thermal shield, the probe will decelerate to 400 m/s within 3 minutes before it deploys a 2.6 m pilot chute at about 160 km. After 2.5 seconds this chute will pull away the probe’s aft cover and the main parachute, 8.3 m in diameter, will deploy to stabilise the probe. The front shield will then be released and the probe, whose main objective is to study Titan’s atmosphere, will open inlet ports and deploy booms to collect the scientific data. All instruments will have direct access to the atmosphere to conduct detailed in-situ measurements of its structure, dynamics and chemistry. Imagery of the surface along the track will also be acquired. These data will be transmitted directly to the Cassini orbiter, which, at the same time, will be flying over Titan at 60 000 km at closest approach. Earth-based radiotelescopes will also try to detect the signal’s tone directly. After 15 minutes, at about 120 km, Huygens will release its main parachute and a smaller 3 m drogue chute will take over to allow a deeper plunge through the atmosphere within the lifetime of the probe’s batteries. The descent will last about 140 minutes before Huygens impacts the surface at about 6 m/s. If the probe survives all this, its extended mission will start, consisting in direct characterisation of Titan’s surface for as long as the batteries can power the instruments and the Cassini orbiter is visible over the horizon at the landing site, i.e. not more than 130 minutes. At that time, the Cassini orbiter will reorient its main antenna dish toward Earth in order to play back the data collected by Huygens, which will be received by NASA’s 70-m diameter antenna in Canberra, Australia, 67 minutes later. Three playbacks are planned, to ensure that all recorded data are safely transmitted to Earth. Then Cassini will continue its mission exploring Saturn and its moons, which includes multiple additional flybys of Titan in the coming months and years. Bigger than Mercury and slightly smaller than Mars, Titan is unique in having a thick hazy nitrogen-rich atmosphere containing carbon-based compounds that could yield important clues about how Earth came to be habitable. The chemical makeup of the atmosphere is thought to be very similar to Earth’s before life began, although colder (-180ºC) and so lacking liquid water. The in-situ results from Huygens, combined with global observations from repeated flybys of Titan by the Cassini orbiter, are thus expected to help us understand not only one of the most exotic members of our solar system but also the evolution of the early Earth's atmosphere and the mechanisms that led to the dawn of life on our planet. Europe’s main contribution to the Cassini mission, the Huygens probe, was built for ESA by an industrial team led by Alcatel Space. This 320 kg spacecraft is carrying six science instruments to study the atmosphere during its descent. Laboratories and research centres from all ESA member countries, the United States, Poland and Israel have been involved in developing this science payload. The Huygens atmospheric structure instrument package (HASI) will measure temperature and pressure profiles, and characterise winds and turbulences. It will also be able to detect lightning and even to measure the conductivity and permittivity of the surface if the probe survives the impact. The gas chromatograph mass spectrometer (GCMS) will provide fine chemical analysis of the atmosphere and the aerosols collected by the aerosol collector and pyrolyser (ACP). The descent imager/spectral radiometer (DISR) will collect images, spectra and other data on the atmosphere, the radiation budget, cloud structures, aerosols and the surface. The Doppler wind experiment (DWE) will provide a zonal wind profile while the surface science package (SSP) will characterise the landing site if Huygens survives the impact. 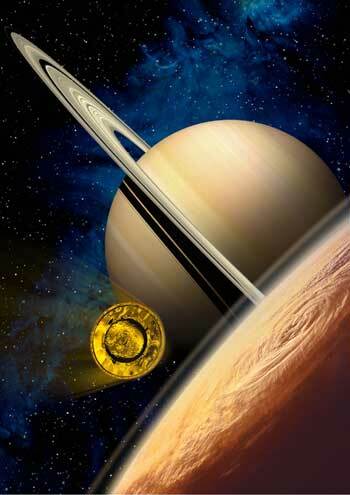 The Cassini-Huygens mission is a cooperation between NASA, the European Space Agency and ASI, the Italian space agency. The Jet Propulsion Laboratory (JPL), a division of the California Institute of Technology in Pasadena, is managing the mission for NASA’s Office of Space Science, Washington. JPL designed, developed and assembled the Cassini orbiter.